Sabinosa is located in the municipality of La Frontera, on the west region of El Hierro in the Canary Islands. On the bottom of the Mencáfete Natural Integral Reserve you might find the town of Sabinosa. One of the most traditional villages on this island. Between vineyards and a beautiful juniper forest that seem to climb to the top of the island, you might find unique trails and streets where you might observe some of the most popular architectonic elements from this island, as well as incredible sights to the western region of Valle del Golfo. Those who enjoy wine tasting shouldn’t miss the opportunity to enjoy the excellent broths from Valle del Golfo. The access roads to get to Sabinosa cross the well taken care of vineyard terraces. On the town centre you might also encounter traditional winepress’. We should also highlight that. apart from other traditional arts, the importance of the craftwork environment. Near Sabinosa you might find other interesting sites as: Pozo de la Salud, an important manantial of medical waters; La laja, a precious puddle, or the Arenas Blancas beach, the only light sandy beach on the island of El Hierro. 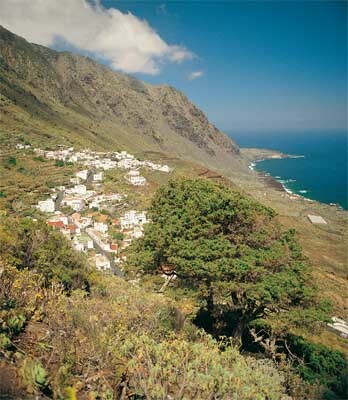 To get to the town of Sabinosa it’s advisable to rent a car in El Hierro and drive to La Frontera. Once there you might take the well known road Calle del Chirgo which departs in Los Llanillos.